Mr. Nagey began training in Martial Arts in 1987 under Grand Master David Okawa Baize in his hometown of Clarksville, Tn. With youth, passion, and a lot of free time, Mr. Nagey progressed quickly in the Shotokan style of Karate taught by Master Baize. In just over a year he had obtained the rank of 1st kyu brown belt, just one rank away from black belt. However, at the age of 20, life tore Mr. Nagey away from Martial Arts training. In February of 2003 his son, Joey, began training in Choong Sil style Taekwondo at Donelson Taekwondo under Mr. Nickolas Zapton. After a few short months Mr. Nagey got the itch to return to the martial arts and also began training with Mr. Zapton. In October of 2003, after seeing his passion for teaching, Mr. Zapton invited Mr. Nagey to begin working part-time in his newly begun After-School Program. 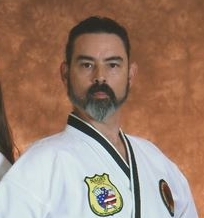 Though only a Green belt in Taekwondo, the techniques and concepts where close enough that Mr. Nagey could draw on his Shotokan training as a source to help him teach class, even to those with higher ranks than himself. In addition, like all Taekwondo students should, the higher ranked students of the school treated him with the same respect as any other instructor. As time went by, Mr. Nagey began working less at his other jobs and more with Mr. Zapton. That following summer, together, they began Donelson TKD’s Summer Camp Program. Not wanting to leave anything incomplete, in his spare time, Mr. Nagey resumed his karate training with Grand Master Baize and received his 1st degree black belt (shodan) in Kami Bushi Kai/Shotokan styles of Karate in March of 2005. Later that year, in December Mr. Zapton awarded him with his 1st Degree Decided Black Belt in Taekwondo. In 2007, Mr. Nagey started a class exclusively for Home-School students and their families which he still teaches to this day. In the summer of 2013, Mr. Nagey accepted the position of Chief Instructor of the Cool Springs YMCA’s martial arts program. After one session, the YMCA decided to close the Cool Springs facility. Those students told Mr. Nagey they would like to continue training. So after a couple months of searching, he was able to find a location and started “Nagey Traditional Martial Arts Academy” or NTMAA.